With alcohol habits varying so much from one person to another, you might wonder if they could have any impact on menopause. In particular, there is a lot of interest in the factors that trigger menopause and why some women experience it sooner than others. One cross-sectional study suggests that there may be a link between alcohol and the onset of menopause. Other research looks at the ways in which consuming alcohol during menopause can affect your menopause symptoms. There has been much confusion about how alcohol influences when you will experience the menopausal transition. There is an abundance of information that cites alcohol as one reason why a woman will experience menopause at an earlier date. Perhaps it is because we often associate excessive alcohol consumption with health problems, so we automatically assume that it will bring about something like menopause, which is associated with ageing. This, however, is not the case. The most recent study suggests the opposite – that women who consumed the least alcohol were more likely to be postmenopausal. Researchers aren't exactly sure if this is directly related to a woman's hormones - namely oestrogen – or if it relates to another factor. There have been some studies to suggest that for some women, the major changes of menopause can combine with stress and challenges in their lives. The result can be that some women end up drinking alcohol in excess. Changes that might be happening now could relate to a woman's health. Often, this is a time when children may be leaving the house or a woman might have some job changes. All of the fluctuations in hormone levels that occur during the menopausal transition can leave a woman more susceptible to alcohol abuse as a coping mechanism. For many women, mood swings are a regular part of the menopausal transition. They can be experienced at virtually any time of the day, making it more difficult to cope with the challenges of work, family and other commitments. 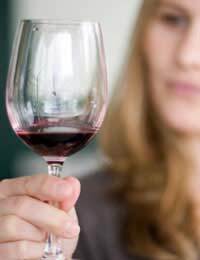 Having a glass of wine after a long day is one thing but for some women, excessive drinking becomes a coping mechanism. It helps them to feel as though they have a handle on the unfamiliar changes of menopause. One of the problems with alcohol abuse during this time is that it can worsen symptoms you are already experiencing with menopause. Hot flushes can become more pronounced and you are more likely to feel tired as well as suffering from disrupted sleep. Libido can similarly be negatively affected by both menopause and excessive alcohol consumption. Another problem with alcohol abuse during menopause is that alcohol is linked to an increased risk of the majority of cancers that occur in postmenopausal women. Each additional drink increases this risk. Excessive alcohol consumption can also lead to malnutrition. This comes at a time when women are losing the protective effects of oestrogen on their bones, so it's particularly worrying. It can feel confusing knowing what to do, mostly due to all the different, often conflicting studies on what's healthy for alcohol consumption. For most women, enjoying the occasional alcoholic drink is safe. While one recent UK study did suggest that even a single alcoholic drink each day raises a woman's risk of certain cancers, most health professionals are saying that moderation remains the best approach. Above all, make sure you access a good support network during menopause. Ensuring you can cope with the changes of menopause will help keep you from using alcohol as an emotional crutch. With the right choices, you can enjoy the occasional drink while also keeping menopause a positive time in your life.